Many people have already discovered how convenient and affordable K-Cup coffee is. A K-Cup is an individual portion pack of coffee which fits into a compatible Keurig coffee machine. Each K-Cup has a tiny coffee filter inside. Ground beans are packed into the K-Cup and sealed with foil and plastic. The coffee stays fresh in there because each container is airtight. Simply pop the K-Cup in your Keurig coffee machine, ensure there is sufficient water in there and put a mug under the nozzle for your coffee to drip into. The brewer will puncture the K-Cup lid and force hot water through it. That is how your coffee is made. That is how easy the process is! No wonder so many people are buying Keurig coffee machines and K-Cups. Not only can you get Keurig coffee K-Cups but you can also get tea, ice beverage and hot chocolate K-Cups which you can use on the same machine. Whatever you are in the mood for drinking, there is a K-Cup option. Consider Mountain Blueberry or Pumpkins Spice if you want flavored coffee, or how about a cup of Columbian coffee to start your day off right? Try single-origin coffees from Colombia, Brazil, Ethiopia, Sumatra, Kenya, Mexico, or Costa Rica, or blends and flavored coffees. Choose from various roasts including light, medium and dark, as well as extra-bold, decaf, organic and Fair Trade Certified. Different varieties have different prices. K-Cups work out slightly more expensive than buying ground coffee, but you are paying for the convenience. Simply putting a K-Cup into your coffee machine is much quicker and easier than having to measure out ground coffee or grind your beans and then wash the French press and clean up afterward. Also, the coffee will stay fresh for longer because each K-Cup is airtight. This type of coffee is still about 3 times cheaper than purchasing coffee at a coffee shop, so you are making a saving there. 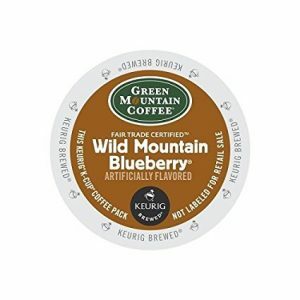 Have You Ever Tried Green Mountain Coffee? Not sure which K-Cup is your favorite? No problem, just buy this mixture of flavors and styles and drink a different one every day! Buying a variety pack is a great idea if you are new to K-Cups and want to test out a lot of different ones rather than commit yourself to the purchase of a package of all the same. This sampler pack offers 35 different K-Cup flavors, and you can try flavored coffees, teas, decafs and more. These single-serve drinks are the best way of treating yourself to new flavors, and you will love the variety. You might even find a new favorite K-Cup flavor. There Is Something For Every Taste, No Matter What Your Coffee Preference Is. So what is K-Cup coffee like, and how does it compare to other types of coffee? First of all, you will be surprised at the range. There is something for every taste, no matter what your coffee preference is. You can also choose tea if you prefer or even hot chocolate. A Keurig machine is a pressure-based brewing system. Simply choose a K-Cup variety, add it to the machine and the hot water will pierce the lid of the K-Cup and run through, producing a cup of coffee in under a minute. Most K-Cups reviews are very favorable, and the sheer variety of drinks is a real bonus. Green Mountain offers tons of different flavors, but there are more than 150 different varieties if you look at all the brands. There are more coffee options than tea, hot chocolate or chilled beverages, which you would expect since Keurig is primarily aimed at the coffee market. Reviewers feel the coffee is pretty good, but not everyone is so keen on the tea. While the coffee is quick and easy to make and offers a smooth, pleasant taste, the tea is not so great. Tea is supposed to brew for several minutes, not have hot water forced through it. Also, the water is 192 degrees F which is perfect for making K-Cup coffee but not hot enough to bring out all the flavor in tea. You might or might not like the Keurig tea K-Cups but you will certainly love the coffee! This beautifully smooth coffee has a really good flavor. The caramel is nice and not too sweet or syrupy like when a coffee shop adds a shot of high-sugar syrup. The vanilla and cream flavors also blend well, and overall this is a fantastic coffee which gets plenty of high ratings. It is perfect for drinking in the morning, and it has a good flavor without being too strong. You can just imagine how great this is going to smell while the brewer is making it, and the taste will not disappoint you. This coffee is carb, fat, and calorie-free but you still get to enjoy the wonderful flavors of vanilla, caramel, cream and coffee. This delicious coffee has a light to medium body, and the acidity is quite low especially if you add a splash of cream. Expect a complex flavor with a little spice and a rich finish. This is a regular blend so if you like your coffee ‘middle of the road’ and not too strong or bitter; this one is perfect. 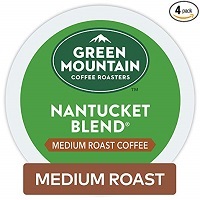 Bringing together 4 different coffees from 3 different continents, the Nantucket blend offers a great flavor, and this one is ideal for making coffee at any time of the day. Perhaps this could be your morning eye-opener or your afternoon pick-me-up. Pumpkin Spice is one of the most in-demand K-Cup flavors, and you will love how it tastes. The flavor is not extra-bold but have your Keurig coffee maker on the 6-ounce setting if you want your coffee strong. Add a couple of teaspoons of cream and a teaspoon of sugar, and you will have something which very closely resembles the pumpkin latte you can get from famous coffee shops. Even if you do not usually go for flavored coffees, you still might like this one because it is so tasty. The nutmeg and cinnamon add beautiful spice, and the pumpkin flavor is authentic. Although blueberries are associated with summer, the flavor of them is appropriate during any month of the year. After all, this coffee is seriously tasty. Offering a hint of blueberry flavor (it tastes a bit like when you take a sip of coffee after eating a blueberry muffin) and an enticing aroma, this flavor is a keeper. Blueberry coffee might sound unusual to you if you are used to drinking unflavored coffee but do give this one a try because it is amazing. Add cream if you like, and perhaps some sugar or sweetener too, to make your cup of coffee your own. Are you into decaf coffee? If so, this is a delicious decaf coffee. The classic blend offers medium acidity and a rich flavor. It is difficult to find smooth, satisfying decafs but this one hits the right spot. Expect a nice flavor without bitterness. 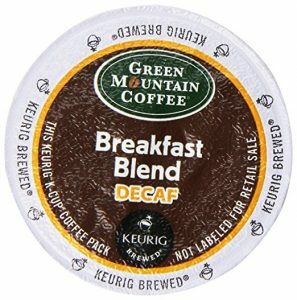 Whether you are drinking decaf for medical reasons or just because you prefer not to have caffeine, you will enjoy this Green Mountain product because the flavor is very good. This coffee has also had a lot of great ratings and positive reviews, so there are plenty of other people who love it too. Flavored coffee fans usually have a clear favorite but are willing to try other flavors. One of the most popular coffee flavors is hazelnut. Vanilla and caramel are also well-loved. Anyone who enjoys hazelnut coffee will be in raptures over this one. The sweet, buttery flavor offers a hint of nuts, and this is a light-roasted coffee for a delicate flavor. This is smooth and tasty and, according to many reviewers, perfect as the first cup of coffee in the morning. Try this flavored hazelnut coffee, and you will not be disappointed. Many coffee drinkers prefer a medium-roast, which is why they would like this coffee. Offering a complex but balanced vibrancy and a splash of ripe fruit Green Mountain have excelled themselves again producing this tasty coffee. It is very smooth and has the body of a typical Colombian coffee without the bitter aftertaste. If you find espresso too strong but light roasts lacking in flavor, try this one. You get a well-balanced flavor. 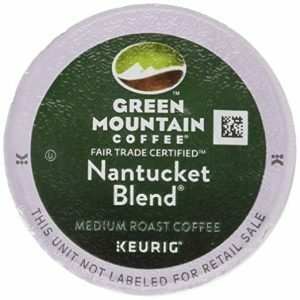 This makes a nice morning blend, and once you try it, you will want to wake up to these Keurig coffee K-Cups every morning. 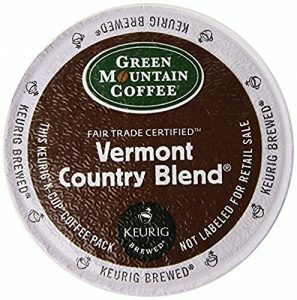 Green Mountain’s Vermont Country Blend is made with both light and dark beans, to give a medium-roasted result. The coffee is aromatic, rich and sweet. The light-roasted American beans offer a clear, mellow finish, and the dark-roasted base has toasty, rich flavors. Together then form a wonderful blend which is smooth and bright. Sometimes combining a good light roast with a good dark roast offers a great result because you get the best of each coffee type blended perfectly in the same cup. Even tea drinkers might be tempted by this blend because it promises all that is good about coffee such as smoothness, richness and a beautiful aroma and flavor. This wonderful Green Mountain coffee evokes the flavor of Southern Pecan. Although a lot of coffees seem to feature a little natural nuttiness, it is always nice when a little extra is added, and you can really taste the pecans in this one in every sip. Whether you add cream or sweetener, or both, or simply enjoy your coffee black, this pecan variety is a winner, and it gets a lot of positive feedback from happy coffee drinkers. The coffee is not too strong and not too weak, but a well-balanced brew and the pecan taste is fantastic. Are strong coffee beans your favorite? No problem. 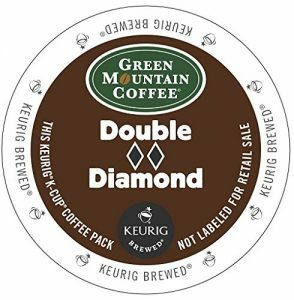 Double Black Diamond offers a full-bodied richness found only in the strongest coffees. The dark, toasty flavor is rich and hearty, and the K-Cup means you can avoid all the mess you would get with a French press. K-Cups are ideal for making a single-serve beverage because it is quick and easy, and there are K-Cup varieties to suit all palates. This is the one to choose if you love the boldness of espresso and you want something very dark without being bitter. You can even reuse this pod to make a second cup because the resulting coffee is so strong. Which K-Cup Flavor is the Most Popular? K-Cups are found in homes and offices everywhere these days. People like to have the choice of which beverage they want, instead of being faced with a coffee pot and no other option. But which K-Cups are the most popular, the best-selling and the best-tasting? Part of the appeal of drinking this type of coffee is trying all the flavors, and do not forget different people like different things. 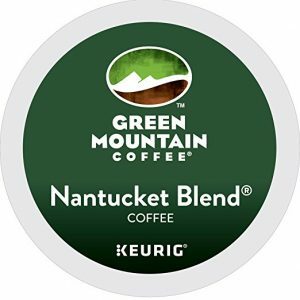 One of the best-selling K-Cup flavors though is the Green Mountain Coffee Dark Magic, which is an extra-bold dark roast. Tully’s Coffee Dark Roast is similarly rich and strong and will wake up even the sleepiest person in the morning. If you prefer a medium roast, you might like the Vermont Country Blend. This K-Cup blends a dark roast with a light one, to get medium results. The balance is good, offering a chocolate roast undercurrent as well as bright acidity. 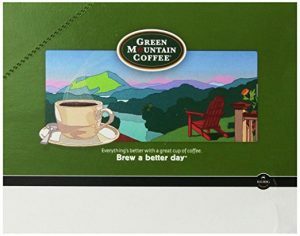 Green Mountain Breakfast Blend features both Indonesian and Central American beans and also sells well. The Green Mountain Mocha Nut Fudge is wonderful for mocha fans, offering a nutty chocolate flavor, although most people recommend adding cream and sugar to smooth out the flavors. 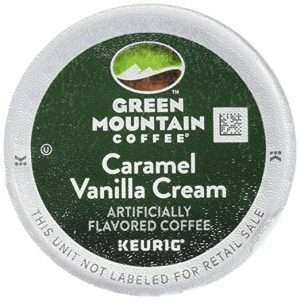 Green Mountain Coffee French Vanilla is another winner, and the vanilla is subtle yet recognizable. 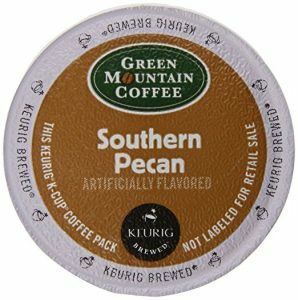 Green Mountain Southern Pecan also tops the best-selling K-Cups chart, because it is buttery and tastes almost like a praline. Because of this richness, it would be amazing served with a cinnamon roll on the side. Try a caramel coffee K-Cup is you crave something sweet. 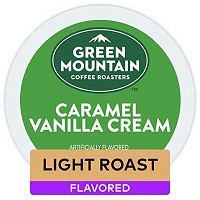 The Green Mountain Coffee Caramel Vanilla Cream makes a great late morning or afternoon treat. It is cream-flavored but not creamy, and although it smells really sweet it is not cloyingly sweet at all, so you can get all the flavor without the coffee being too creamy or too sweet. Of course, you may add as much creamer and sugar as you wish. 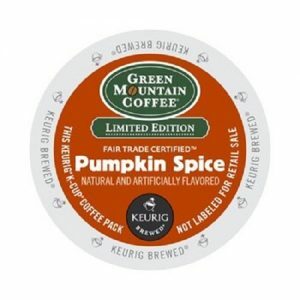 Another favorite is Green Mountain Pumpkin Spice which smells more of spices than of pumpkin, but that is similar to any pumpkin product. Pumpkin bread and pumpkin pie smell more of spices than pumpkin. The toasty cinnamon is aromatic, and the coffee itself is light, although you will probably want to add a splash of milk to cover the slight bitterness. 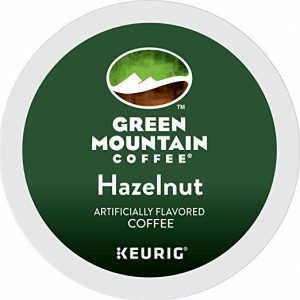 Of all the most popular K-Cup options, it seems that Green Mountain is in the lead, probably because you can choose from so many alternatives depending on the time of day and your mood. Buy a K-Cup selection pack, and you can try all the different flavors for yourself.